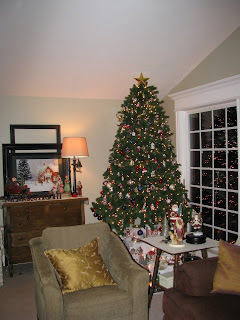 The living room tree is known as "mom's tree" because, traditionally, I really enjoy decorating it by myself. I turn on Christmas music and wax nostalgic as I hang the real glass ornaments. Many remind me of the ones from my childhood. Usually I break at least one ornament every year, and if I don't, then our cat or a son does. I chalk it up as part of the Christmas tradition. Fortunately, most ornaments were purchased on clearance or at the thrift store, so I don't make a fuss. This year the tradition changed a bit. I was blessed to have my newly married daughter and son-in-law help decorate the tree. It's so fun to have them here visiting. And, I enjoyed EVERY minute of their help. After the tree is decorated, the real fun begins. 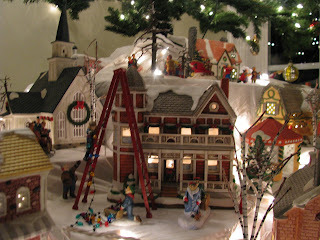 The village gets placed underneath the tree (which is why our tree is on stilts). It's a tradition to have my boys set up the train track before the houses get placed. If you look very closely (click the picture to enlarge) you'll notice lego men on the train track. That's a tradition too! Right after everything is finished, my boys have each enjoyed giving their toys train rides. . .or train crashes. My kids have all grown up with the village as part of our Christmas tradition. We like to lie on our tummies and tell stories about all of the village people. Every year there are certain villagers who have to go in the exact same place. Santa and the elves are always high on the "mountain" so they can look to see who's been naughty or nice. The kissing couple, my daughter's favorite, always go in the gazebo. The "rich lady" is always leaving her large home to go on a trip for the holidays. The dog always chases the boy on the bike. . .except for the year that my third son decided he needed that little dog and would take it to his room to play. The family is always place by the nativity scene at the church as a reminder of our Christmas Eve tradition of going as a family to see the lights of the city and hear the story of the birth of Christ. I hand painted some of the villagers many years ago. None of the houses cost very much. Super glue is used to repair something almost every year. Our village isn't all that special, but the traditions and the memories associated with it are very, very special and dear to our family. All I can say is WOW!! Your kids must spend ours just staring in amazement at all the fun little things to see. Oh WOW! This time you have REALLY amazed me! You always do, but I have always loved those little villages but have yet to start a collection. What a great idea to put it under your tree. Thanks so much for sharing your home and traditions with us. What an amazing gift you have. Thank you. 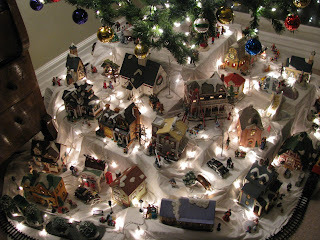 I love the village under your tree...I've never seen that but love it!! 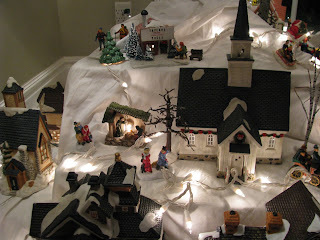 I have never seen such a beautiful village display, and I loved reading about your family's traditions and memories! Have a wonderful Christmas holiday. That is beautiful!! I mentioned a few months ago that I was turning some old kitchen doors into things for my kids- come check in around the weekend I'll hopefully have pics up of our first project with them. i love it!! that whole post, pics and all your goodies are wonderful!!! 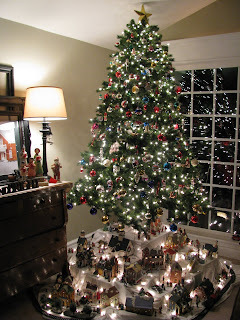 i think it would be so great to have a set up under my tree like that!! Wow, can my 'village people' come over and visit your 'village people'? That has got to be the best village I have seen yet. Your home is beautiful. I love it. Hope you have a great Christmas! wow, that would look like godzilla came and destroyed the village if it were in my house...i have 4 godzillas that would not stop till every single house was terrorized! I just wanted to say what a truly breathtaking tree and village!! It is a work of art - an absolute joy to look at! Your village under the tree is wonderful. I hope you and your family have many hours of enjoyment during the holidays. Merry Christmas! That is absolutely amazing! I have never seen anything like it, Joy. What an awesome tradition and such sweet memories you and your family have! Thanks for always inspiring me and sharing a little peice of your life with us! I hope you have a wonderful Christmas with you loved ones and a blessed new year. Oh I love it!..it is a winter wonderland all under your tree..I love the stories you give them...Have a wonderful christmas and all the best for 2009! I love the way you elevate your tree and put the village underneath! I have some Department 56 houses and can never figure out how to display them. What a wonderful idea! I love this! My mom is a HUGE Department 56 Snow Villiage Collector, I have to show her your villiage! I always loved setting it up as a child and still do even now! :) HAve a VERY Merry Christmas!! I love your village and the artistic way you have it displayed! Wow! What a wonderful way to display your village! I've never seen it under a tree before and it's beautiful! What fun for your children, too. WOW WOW WOW!! That is just BEAUTIFUL!! What a wonderful display!! Very pretty. What a fun tradition! WOW Joy, that is amazing!! I would sit there on my tummy staring at it! :) I love all the little details. Thanks for sharing it -- Merry Christmas!! I grew up with a "village" and my parents still love it. Both of my brothers have taken up the tradition - and maybe I will after the rugrats in my home get a little big more control of themselves! The village is beautiful because of the memories! I think that is so wonderful! 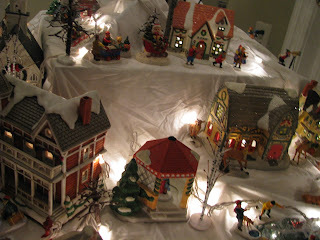 Your Christmas village is gorgeous! How creative to put it under your tree! That is unreal, I love it. Gorgeous...and so rich with memories, that's priceless. Hope you had a very Merry Christmas, Joy! 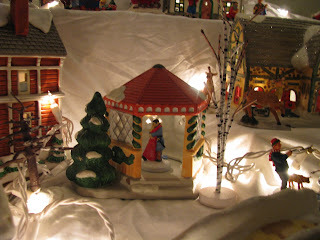 The Christmas village is such a great tradition. I don't know of anyone else with that many Christmas trees! Love the variety! 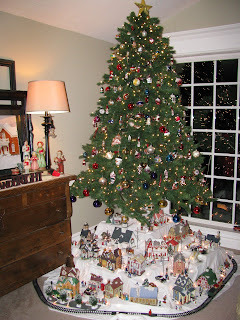 I also have a "mom" tree that I decorate alone since many of the ornaments are very fragile. You can check it out on my blog. My kids have a tree that is down in "kid world" aka the basement that has all of their handmade ornaments plus we give each child an ornament in their stocking every year. The hope is that when they leave home, they will have an assortment of ornaments to take with them. i love your village! what cherished memories. and i am glad you had your daugther and SIL to help put it together. 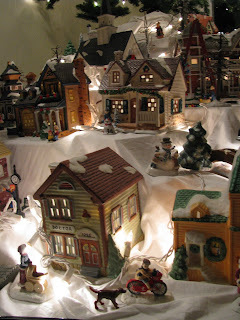 Your Christmas Village IS TOO all that special! I have always wanted one of those..and never was able to get it. Now the babes are all grown with babes of their own and still, I think of starting to collect..but..the passion to have one has passed. So..I will enjoy yours and continue dreaming. Thank you for sharing. I enjoyed my visit. :) Happy New Year! That is amazing....I LOVE that idea....I'm going to have to remember that one!!! It is so beautiful!! !